Heat oven to 350°F. Spray 8-inch square (2-quart) glass baking dish with cooking spray. Break waffles into 1- to 2-inch pieces; place in bottom of baking dish. Drain pineapple, reserving juice in small bowl; set pineapple aside. Gently stir bananas into juice to coat. With slotted spoon, place bananas evenly over waffles; discard any remaining juice. In medium bowl, beat eggs, granulated sugar and 2 tablespoons of the brown sugar with wire whisk until blended. Stir in drained pineapple. Pour mixture over waffles and bananas. In another medium bowl, mix crushed granola bars, nuts, flour, remaining 3 tablespoons brown sugar and the butter until crumbly; sprinkle over top. Bake 30 to 35 minutes or until knife inserted in center comes out clean. Cool 10 minutes. In small microwavable bowl, microwave spreadable fruit uncovered on High 1 minute. Stir; if necessary, continue to microwave on High in 15-second increments until melted and smooth. Cut waffle bake into 6 servings. 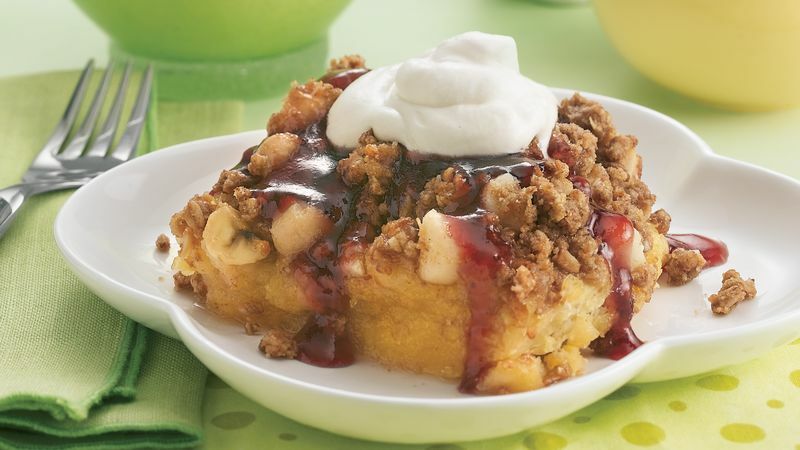 Top each serving with about 2 tablespoons warm fruit spread and 1 to 2 tablespoons whipped cream.